I Have A Mixed Marriage! It's true! Take a look! Do you remember Kim's post at Savvy Southern Style titled "Sunday Supper"? 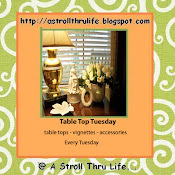 Kim's post featured their supper table on ordinary nights, when there were just the two of them. 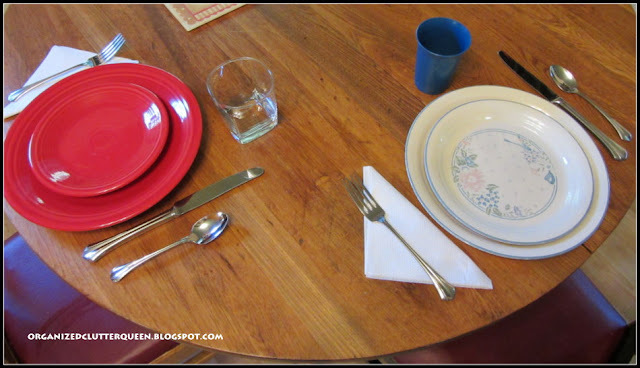 When I was growing up my family was a "Corelle family". My Grandma A, my Mom, and my Aunt all had Corelle. In 1976, I joined the family with my set of Corelle, and I think my cousins also got a set. I'm not 100% sure but I think most of us had the green flowered "Spring Blossom" pattern. 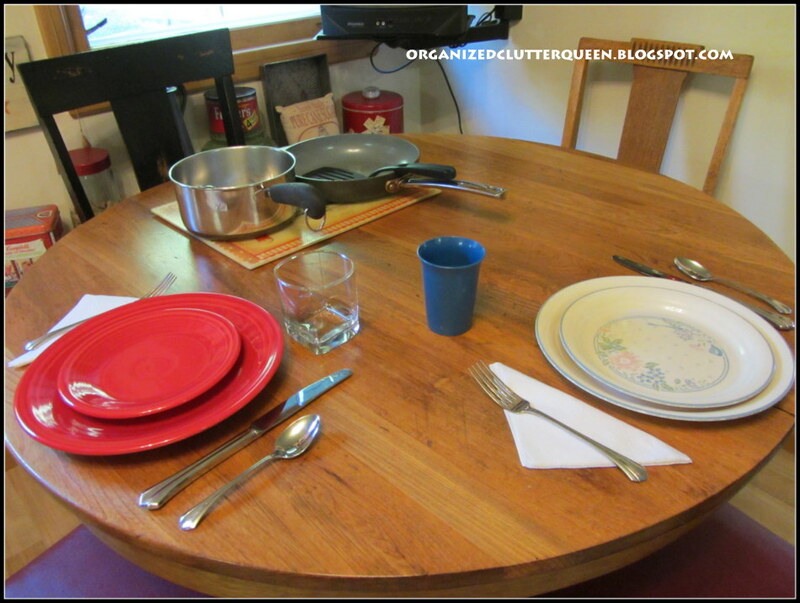 We had the butter dishes, the bowls, the platters, the salt and pepper shakers, the works. 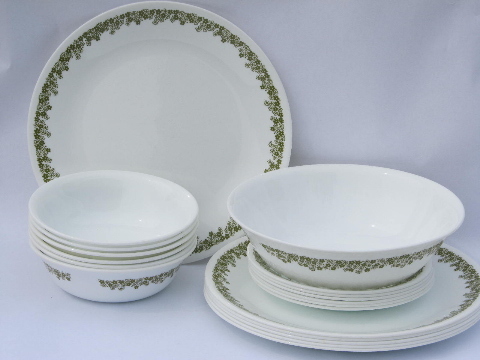 In 1993, I was remarried and I got another set of Corelle for a wedding present from my family. They let me choose the pattern. At the time I liked wedgwood blue, mauve, peach, you remember the era, right? A little over a year ago, my daughter asked what she should get me for Christmas. I said, "New dishes". I told her that I had always wanted Fiesta. So for almost every holiday since then, she has been getting me more pieces of Fiesta in scarlett, and I have picked up some serving pieces myself too. My husband, a stubborn (no change necessary ever) kind of guy, prefers to continue to use the Corelle. He has labeled the Fiesta dishes as the good dishes. I want to use them as our everyday dishes. I have blue willow for the good dishes! This is his. He seldom even uses an adult glass. Instead, he prefers the kids' old tupperware plastic glasses! 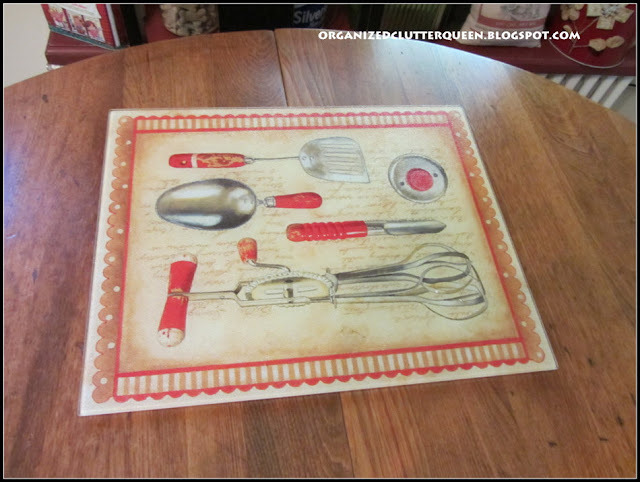 To round out our usual dinner table is the Counter Art glass trivet, cutting board. So on any given night, you can see this... That's if I decide to cook, and that's not very often any more! Haha, I love it! Your husband sounds alot like mine! This cracks me up. My guy looks at my tablescapes but seldom do we really eat there! Keeping it real is funny!! Sweet that you sit next to each other ;) !! My hubs is not that easy. I know he would've prefer the red set and of course, a real glass, lol.. He actually loves my mom's Corell, with the lght brown little flowers mother still uses from way, way back. the 60's, lol.. Yes, I too remember mother using Corell everyday and me eating out of them. I love the mix and match too. Have a fun week. That is too funny! My dh won't drink out of plastic or use paper. 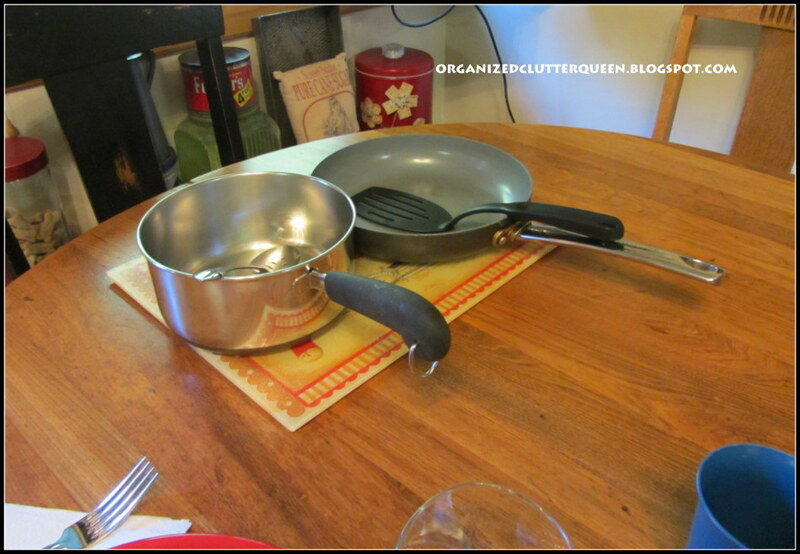 Even when I worked full time the table was set, and I cooked every night. I must have been crazy! You've got an easy going dh there, good for you! I have a set of Corelle in the beach house, and they still look great! White with a yellow band. Hi Carlene: This was a fun post. I'm glad you've worked out a system that makes both of you happy! I like to make a Sunday brunch for us, and I am more particular about dishes I like to use for that so it's color-coordinated and pretty, but on weeknights it's whatever! 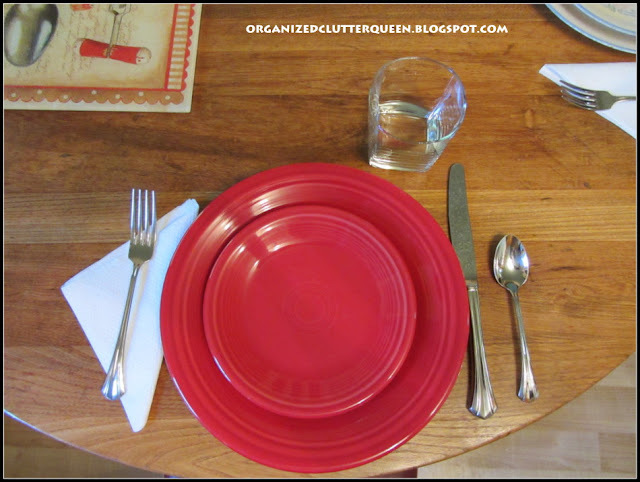 My husband will eat off of any plate I put in front of him ~ BUT will only drink out of a very certain glass. I can't complain though because I have my own very favorite glasses too. Whatever floats your boat is what I say! Yes I remember the corelle! Your husband sound a little like mine! We eat out of the pots - it's just us! But i do fix the hubs plate (wish I hadn't started that trend). I enjoyed your post, now I know I'm not the only one married to someone who doesn't like CHANGE! 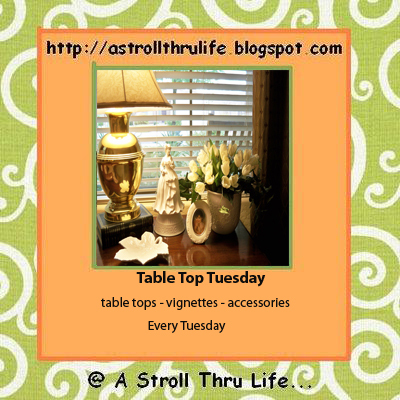 I checked out your tole tray - so pretty - I found one two!! Very funny! My mother had the green patterned Corelle. I'm one of those people that cannot eat off of Corelle! The sound of it is like fingernails on a chalkboard to me. I'd use the Fiesta plates, too. 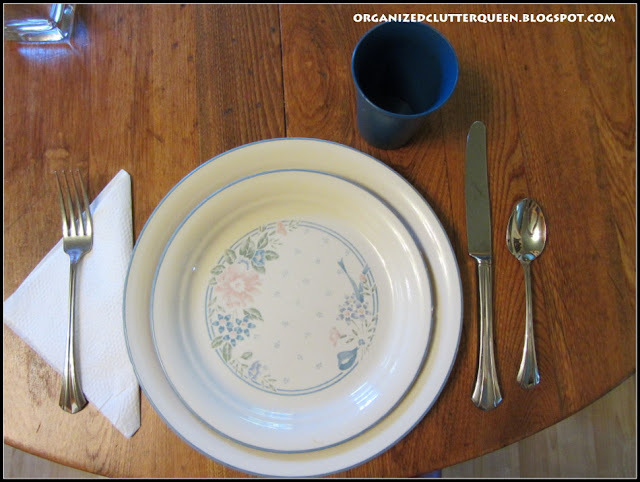 You could always stage a break-in so it looks like all they got away with is the Corelle and the Tupperware cups. Hehehe. Hee hee. Sounds like my friend who shares my house and me. He likes eating straight out of the microwavable bowl/tray you get with frozen dinners. Me I like to plate it out. Got to have some decorum, hey! But I am totally into plain white plates lately. Probably coz I keep smashing all the nice patterned ones. White ones are so much easier to replace! Great post about real life. Love it! Ha ha...I love that you're both just fine with doing your own thing, yet you sit next to each other at meals. Sweet! I've been collecting Fiesta for @ 19 years now and I just can't get enough. Enjoy! lol So funny :) Thanks for sharing!